Welcome at mtgcards.be. Your online source for all possible items related to the best trading card game ever... "Magic: the Gathering". Want to play? Check out our calendar and join us! For more information, check our forum. As from 2017 we play at Jongerencentrum Bouckenborgh, Bredabaan 559, 2170 Merksem. GPS = "Oude Barreellei", turn at SHURGARD to park at soccer fields - walking distance! If you want to order some products and/or cards, you need a mtgcards.be account. Register one on our forum. This forum-account is used on this site as well. After logging in, you'll have access to your personal details via the left column. Challenger Decks will be available April 12, 2019 and are your on-ramp to Standard! 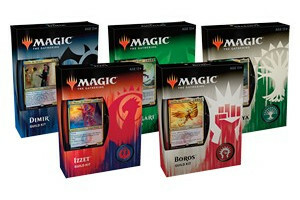 These four individual 75-card decks are geared toward Standard play for the Friday Night Magic player and forged out of some of the most powerful strategies in Standard. Each Challenger Deck comes with a complete 60-card main deck and a 15-card sideboard, and is intended to be playable and competitive at a local level right out of the box. Choose your commander and carve your path to victory in this unique multiplayer Magic format. Call on powerful planeswalkers and deploy their signature strategies to make sure you are the last player standing.